This dish is fun and easy to make -the healthier way to eat chicken goujons. Preheat the oven to 190oC/gas mark 5. Line a baking tray with non-stick baking paper. Scrub the sweet potatoes well and leave their skin on, then cut into wedges and pat dry with a piece of kitchen paper to help them crisp up. Place the wedges on a baking tray and toss with the oil, thyme and paprika, then season generously with salt and pepper. Roast in the oven for 15 to 20 minutes, then turn the wedges over and continue to roast for another 15 minutes, until they are crispy and lightly browned. Meanwhile, place the almonds and oats in a food processor and whizz until they are finely ground. You want them to be as fine as breadcrumbs. Add the paprika and whizz for 10 seconds more, then tip out into a shallow bowl. Place the flour in a separate shallow bowl and season with a pinch of salt and pepper. Crack the egg into a third shallow bowl and lightly whisk it with a fork. Line up the bowls in order: flour, egg and the ground almonds and oats. First dredge the chicken strips in the flour, shaking off any excess, then dip in the beaten egg, again shaking off any excess. Finally, place them in the oat and nut mixture, pressing gently to make sure they are completely and evenly coated. Place the chicken goujons on the lined baking tray. Cook in the oven with the sweet potatoes for 15 to 20 minutes, until the goujons are completely cooked through and the coating is crisp and golden. 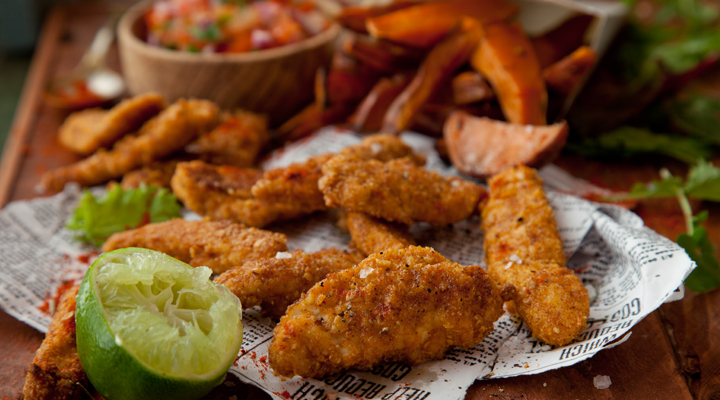 Serve the goujons with the sweet potato wedges and some salsa and lime wedges on the side.